You might think that I’d learned my lesson when it comes to rabbit breeding, and you might be wrong. If you recall from the First Birth on The Farm, I was a little late in figuring out whether Mama rabbit was pregnant, let alone when she might be due. Once the little suprises showed up – not six or seven, but eight of them – I was determined not to let that happen again. To prevent the tiny newborns from becoming a tasty meal, I had immediately removed Papa rabbit (Fred) from the cage after discovering the nest. And, I rested at ease, knowing that Mama was clearly going to take very good care of her kits, as noted in Ten Day Old Kits Safe and Sound. The next question, I thought, was when to remove the young rabbits from Mama’s cage; surely she deserved some peace and quiet when her job of raising the kits was done. So, when would that be, exactly? I thought I would be able to determine that time by carefully observing Mama and noticing when the kits were weaned. Well, of course I didn’t realized just how quickly the now furry and cute-as-could-be critters would grow. At about three weeks old, I noticed that the cute-as-could-be young rabbits were starting to nibble the rabbits pellets and suckle the water bottle. OK, I thought, soon they would need to be moved. Probably no reason to rush though; they didn’t seem to be bothering Mama. When I discovered the first batch of kits, I had been hesitant to disturb the nest. This time, I had to know: was this another litter from Mama? I gently pulled the hay away and, sure enough, there were more tiny kits! Four more kits….is this even possible? Well, Papa was still with Mama for another day or two after she gave birth, what, 30 days ago?! Rabbits have a gestation of 30-32 days, and here they were right in front of me. 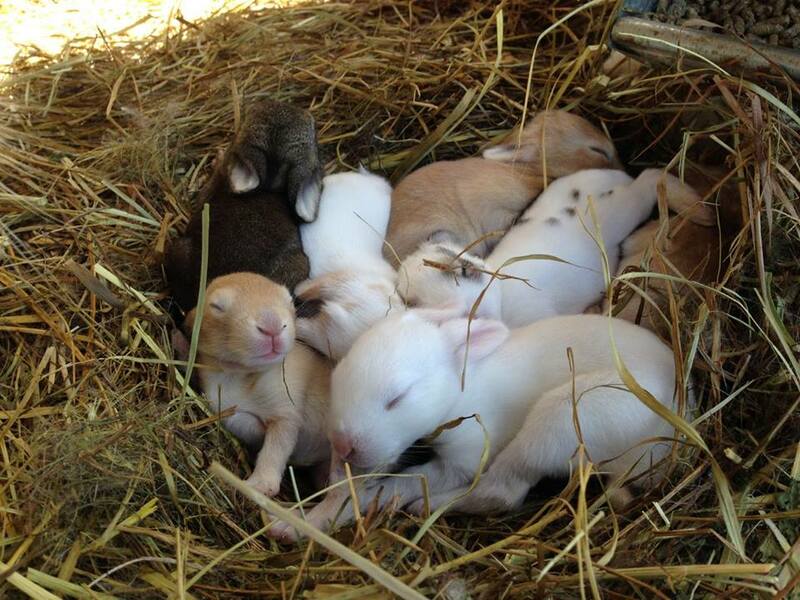 So, yes, rabbits really do multiply like rabbits! We moved the now 4 week old rabbits upstairs and added manure shelves under them to prevent droppings from raining down on Mama and Papa. Mama seems content raising the new kits. This time, no Papa to continue the lightning-speed reproduction. We also separated the other male/female pair that had been sharing quarters up until today. Based on our rabbit breeding experiences to date, I’m certain that this female will give birth within a week or so. I guess its time to start planning our preferred method of….processing. Learning everything from the ground up sometimes feels like standing underneath a waterfall trying to keep dry. You might think that I'd learned my lesson when it comes to rabbit breeding, and you might be wrong.